Edgar Codd proposed Relational Data Model in 1970. It is a representational or implementation data model. Using this representational (or implementation) model we represent a database as collection of relations. The notion of relation here is different from the notion of relationship used in ER modeling. 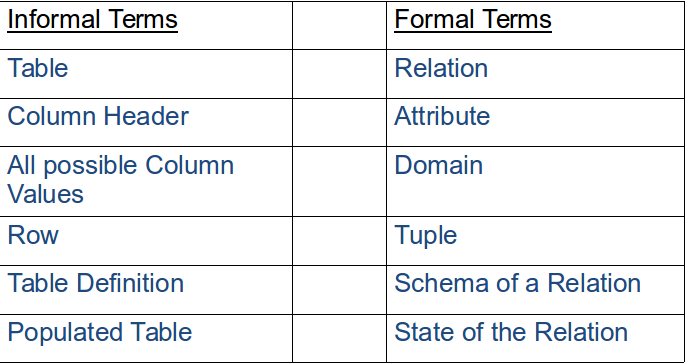 Relation is the main construct for representing data in relational model. Every relation consists of a relation schema and Relation instance. The number of columns in a relation is known as its degree or arity’. Each row in the table represents a collection of related data. Each row contains facts about some entity of same entity-set. r is an instance of R each t is a tuple and is a ordered list of values. Ordering of tuples is not significant. Ordering of values in a tuple is important. 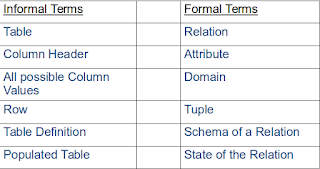 Values in a tuple under each column must be atomic (simple & single).